I also tried all of the DP mentioned here. But the main reproach I make (and nobody speak about that), is the "speackerish" sound reproduction. I'am not a sound engineer, and so I don't know how to express it clearly, but it is just a feeling : my ears kwnow exactly where the sound comes from, even though the sound (the sample and sound engine) is very good. May be it is because the sound coming from the top of the cabinet (tweeter, I think) is set too high in volume : I can touch this sound, I can point my finger toward the exact position of these tweeters, hidden behind a black tissue. I compared with my old CLP 170 : 4 speakers in front of the legs and 2 tweeters on top : the tweeters a set quite low, just for the high harmonics : almost all the sound comes from below, and I think it feels more natural, the sound seems to come from a larger area. On top of that, the CLP 170 had 2 rear speakers for ambiant (resonnance) sound, which was AMAZING. It is a shame that Yamaha stopped this technology. On the other hand, with the N2, the sound seems to come from a large area in front of you, like in real grand. Your imagination can see the strings vibrating in front of your eyes, it was so amazing. In my opinion, the main advantage of "cabinet DP" should be the sound reproduction, (otherwise, why not a good keyboard+speacker+computer+VST ?) : the advantage of the cabinet is rigthly the possibility to reproduce the sound projection of a real piano. That is why I am interested in Kawai approach with their soundboard : this concept is exactly what I expect from a cabinet DP : to exploit the advantage of the cabinet. I think DP manufacturer should spend more time and money in sound reproduction, as they can't compete with sample quality of VST and their GB of memory. Last edited by olivier du nord; 01/16/18 04:42 AM. Yes, the speakers have been a perennial dud in console pianos. If they want to collect a large sum for the sale of a console piano then it ought to have sound reproduction better than that of a slab. But it doesn't. I've never heard a CLP170, nor the latest CLP685. But your description of the latter is oh so familiar. I find it interesting, though, that the tweeter volume is set too high in the CLP685. In my CLP240 the tweeters are nearly inaudible. All the sound comes from below. Not good. And in all the years since Yamaha has done nothing to improve the sound system. So I'm leaning toward Kawai. The sound performance of the previous generation Kawais did not impress me, although the action did. I'm left to wonder what the new 98 sounds like. I guess I'll have to make the trip. I have my CLP-685 since friday last week and i'm having a blast compared to the CA-98. After a couple of hours playing, i barely notice any clickiness anymore. Also the heaviness has gone. This effect doesn't happen if you test it in the store. It takes some time to become familiar with this action. I demoed the CLP-685 a few weeks ago, and didn't like the action at all - it wasn't so much the clickiness, but that it felt like you had to push the keys past a 'notch' to get them moving... This made playing pianissimo VERY challenging! I'm sure that you can get used to any action in time, but I'd be concerned about what happens when you return to a real piano - the transition may be challenging! I think i won't get into a situation where i have to sit at a real grand for the next years. so it's not a problem right now. It's like shoes. You have to walk in them to getting comfortable with. Last edited by Tyr; 01/16/18 09:23 AM. I've had the CLP-685 for a few weeks now and it's made the transition to my teachers grand so much easier. Previously when I'd go to his piano I'd have such a difficult time getting the dynamics correct and hitting trills consistently. It's made a world of difference. I've also tried a few grands with lighter actions than my instructors and found it equally easy to transition. On the other hand after practicing 100% on the 685, when I go back to play my Kawai ES110 (which I had been playing since they were introduced) it's like playing a toy, not in a bad way, but it's so light and easy. I'm definitely convinced that getting the 685 was key to being able to play more accurately on a variety of acoustics. I'm really pleased with it so far. My teacher noticed the improvement after just a week of playing on it, and this was unprompted by me. As to the directionality of the speakers, I find it's only noticeable when sitting playing, though I'm "getting used to it." However, when sitting away listening, the directionality goes away and listeners are fully convinced it's producing sound like an acoustic. Also, I'll add that the binaural sampling with headphones on is really quite effective. Last edited by squidbot; 01/16/18 03:40 PM. @ Squidbot: Did you noticed that the binaural sampling will go through the speakers while you have your headphones connected and set the speakers to always on? You probably don't want to do that. The way binaural audio works is to pipe the specific sound each ear hears, only to that ear. So for the effect to work, you need to be using closed-back headphones (no Sennheiser HD598s for this) or earbuds, which isolate the sound for each ear. If you have open-back headphones, the sounds and their timing will bleed to the other ear, interfering with the effect. If you play the binaural audio through speakers at the same time, you'll pollute the source to both ears. Glad to see the range of opinions on these models. I spent half a day at a Yamaha dealership a month ago and walked away with a strong preference for the CLP-685. I too was surprised that there was such a difference between the 685 and 675 considering that counterweights were supposedly the only difference. I noticed less of a difference between the 645 and 675 whose keybeds have entirely different brand names (NaturalWood X vs. GranTouch); their main advertised difference is the key length and pivot point. I recognize other descriptions of the 685 from my test drive, such as the heavy touchweight and noticeable faux escapement. They didn't bother me at the time, and when I went back a week later to confirm some complaints I was reading (especially key noise, which I didn't notice as problematic at the time), they had sold their floor model. I ordered the 685 on the proviso that I'm allowed to return it if I don't like it within a week. I wonder if maybe the 685's key feel stands out not because it's better but because it's distinctive. I don't expect to be disappointed, just curious how my opinion is informed by my limited experiences with the much older dp that I'm replacing. Yamaha's upright hybrid was astonishingly good in the store. I told myself that the 685 would be closer to a grand action, but I haven't considered carefully what I mean by that or why I'd want it. The bit about repeating keys always stuck in my mind as something I'd need once I graduate to fancier pieces, though I'm hardly there yet. I played some grands in the store and wondered if the lighter touch and louder sound would give me more expressive control someday. I still settled on the 685. As there appear to be many Kawai fans on the forum, I'm curious to know how more people feel about the "muddy" sound of the soundboard upright models. I tried one and noticed the muddiness through the soundboard immediately, and I couldn't get it to sound better by adjusting things. I thought maybe it was broken or not set up correctly in the store. I have no doubt that it's a good piano in general, it was just weird to be put off by it so quickly. I wasn't considering it seriously or I would have paid closer attention to key action and such. I tried one and noticed the muddiness through the soundboard immediately, and I couldn't get it to sound better by adjusting things. I thought maybe it was broken or not set up correctly in the store. I have no doubt that it's a good piano in general, it was just weird to be put off by it so quickly. I wasn't considering it seriously or I would have paid closer attention to key action and such. This is exactly what i had experienced. I tried a CA-97 before the CA-98 was released and i bought the 98 based on this test since it should exactly the same with newer tech like the better controls via touchpanel and the pianist mode. I didn't recognized this sound on the CA-97 or it wasn't really present in the store but at home i noticed it immediately and had worries if it's broken or something. At the end, i thought the environment has some negative impact on the sound but my new 685 works perfectly at the same spot. At the end, i came to the conclusion that i simply don't like the Kawai sound at all. All of this makes me want to get back into the shops to try the newer pianos. My last foray was over a year ago and I tried the then-current Kawais. But no Yamahas. - My own CLP240. The sound sux. I never use it. It's all in the VST pianos now, and has been for years. - The next-gen 300-series CLP. Same sound. Sux. - I've not tried the 400-series, nor the 500-series. is this muddyness just on the soundboard models, or on the speaker only variants, also what about headphones? Trying to isolate down here if it's specifically the soundboard speaker system or the SK-EX sample. The latter is certainly more mellow than the yamaha CFX sample used on the clp line is. 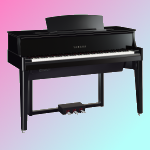 When I tried the CA98 I noticed the new Piano mode with new sound engine (SK-EX Rendering), was more "muddy" (but with very good sound in headphones) than the older sound engine of the instrument (Harmonic Imaging XL sound engine), which was more clear. It may be due to a lot of resonnance in the new piano mode. But we are far from the original topic of this thread ... I have opened a new thread about the CA 98 if you have more informations about it. For the original poster: It is pretty much up to personal tastes. If you have tried all the models and your cents are for CLP-685, that is the most important. It might worth to check for the new CA-98 as alternative for CS-11, even if it is available in different colors only, as it has some improvements with respect to sound. As far as I understand, some people prefere Yamaha key actions and some other prefer others in general -- and most likely they both imitate grand piano actions, but different ones... Probably an important factor why it is much up to personal tastes. So if you like to play your piano in the house at a moderate volume without headphones - forget it! The sound - in my opinion - is also less 'electronic' than many other similarly priced digital pianos I tried. Before you purchase go into a piano shop and play something at a very low volume so you can hear how loud the keys are - and listen to the Bosendorfer - I don't see how Yamaha can make that a part of their sales pitch for any of their pianos - it's just a dull muffled sound! Nearly all piano voices are really good except the Bösendorfer Samples which are underwhelming and never sound like in the promotion videos. The ballad grand is one of the best balanced samples i've ever heard on a digital. The key noise is nothing compared to a hybrid like NV10. I know this phenomenon. I had to slide down the whole keyboard once to loose the keys every time after a break. Last edited by Tyr; 05/24/18 06:25 AM. I tried out the CLP-685 for the first time and in comparison to my CLP-990, Yamaha has not been able to surpass it in sound and feel just yet in my opinion. I just hope mine continues on for many more years to come.